Daniel Tiger’s Neighborhood is a new TV series on PBS which builds on the legacy of what Mr. Rogers meant to our kids. And of course there is a new toy line to go along with the show. I am so happy to be able to bring you this wonderful giveaway opportunity today. If you are a grandparent, there is a good chance that the mere mention of Mr. Rogers brings a smile to your face. When our kids were little there was a small fraction of the TV shows for children that there are now and most of it was pretty bad. Sesame Street was action packed and great for learning numbers and letters. But ahhhhh…. Mr. Rogers. He dealt with your feelings and how to treat others respectfully. If your kids became engaged as mine did, they learned values and you could have conversations with them about the stories. Whether it was dealing with emotions or a stressful part of life, Mr. Rogers guided us through with his gentle manner. His show was really in a class by itself. This year, Daniel Tiger’s Neighborhood from the Fred Rogers Company has premiered on PBS and the legacy of Mr. Rogers continues in this series. This is an animation show and the main character, Daniel Tiger, is the son of the original Daniel Tiger (I guess that is so us old folks can participate with our imagination) and each episode features two stories using imagination, creativity and music to deal with social issues for a young child in a 21st century way. When I attended the Time to Play Showcase in New York in September one of my favorite new toy lines was Daniel Tiger. 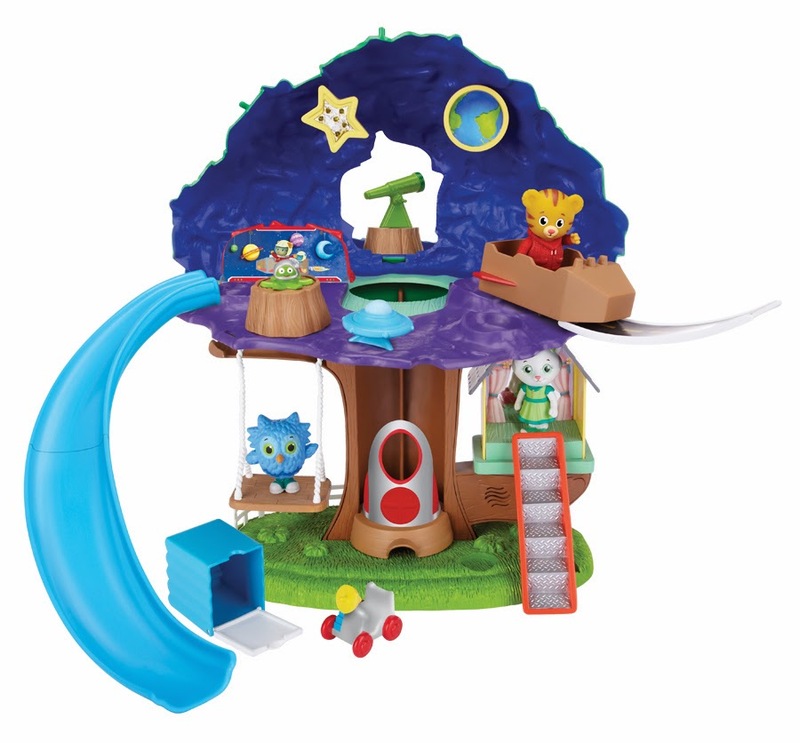 Jakks Pacific is sponsoring this giveaway of a Daniel Tiger's Neighborhood 3 in 1 Transformation Treehouse . If your child watches the TV show they will have hours of fun with this set. 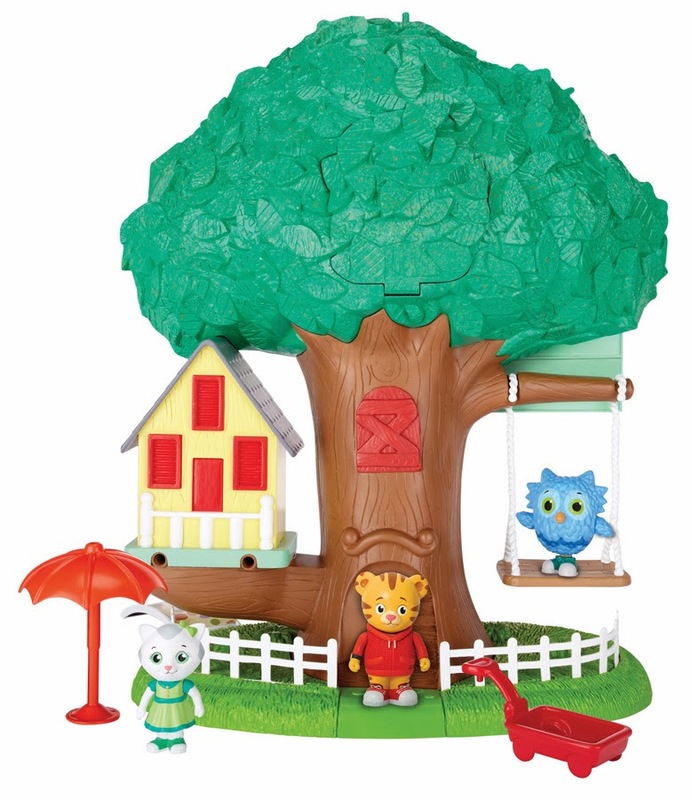 The set includes Daniel Tiger, O the Owl and Katerina KittyCat figures and 13 additional play pieces. The treehouse transforms into three sets – the front yard, inside rooms and a space station. The package says that this is for 3+. I’m sure that this is because of the small parts. They are made of sturdy plastic but I would be careful with children who are inclined to put things in their mouth. I think any child who watches the show will enjoy this set and that will be 1 year olds too, but if a 1 or 2 year old is playing with this toy he or she should be with an adult. Soooo - this is actually a good toy for a grandparent to play with a grandchild. The transformations will be too hard for young children to do by themselves, but they will enjoy having the different sets to play with. One of my favorite features – no batteries and no lights!! Hurrah!! There is an easy to turn dial that briefly plays a tune as KaterinaKat turns. It’s very cute and I can picture a toddler smiling and wanting to do this over and over. Pushing Daniel down the slide or Owl on the swing will make a child want to play outside. It is chock full of imaginative possibilities. There is a mismatch between the ages of children who will enjoy this toy the most (1-3) and those that it is suitable to play alone with (3+). But it is a good toy to play together (grandparent and child) with toddlers and pre-schoolers. My grandson, Zach, was at our house for a haircut compliments of Pop yesterday and I always let him choose a present after a haircut. He is 4 1/2. He was looking over the treehouse with great interest and knew all the characters. But after the haircut he chose a Transformer's Construct Bot as his present. He read the numbers on the box describing the three transformation sets and told me it was for a child who was 1, 2 or 3 and would be good for someone in the little kids' class at his pre-school. We had come to the same conclusion. It is pricey but shop around for holiday sales and ToysRUs seems to be featuring the best price at $39.99. I have a link below to Amazon for convenience but for whatever reason it is very high priced at Amazon right now. 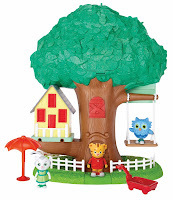 You should also consider some of the other Daniel Tiger toys in this line including the Daniel Tiger plush, the neighborhood trolley and character pieces. They are more affordable. See the Amazon links below. This is also an outstanding giveaway opportunity and it is easy to enter. See the details here. Like The Grandma Chronicles facebook page. Click Here. 2013 at midnight. The winner will be selected using random.org. Full Disclosure: This review is completely my own opinion and I was not reimbursed for it. I did receive a review sample. I did see the full line on display at the Time to Play Showcase in September. would love to win this for my Jack ! 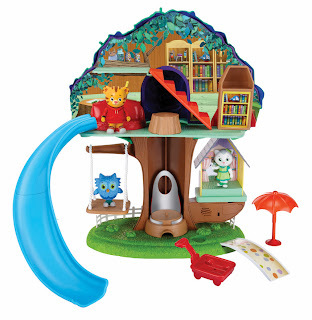 Lilly would have hours of fun with this treehouse! We love Daniel Tiger!! My daughter would love love love to play with this!! Daniel is a fave at our house! My grandson loves this show! I would love to win this for my grandson! What a cute toy! I would love to win this for my daughter, thanks for the opportunity! My sons both LOVE Daniel Tiger's neighborhood! It is so cute to see my favorite characters in an animated series. Thank you so much for the chance! We're BIG FANS of Daniel (& especially Miss Elaina!) in Our House! Could this toy be any cuter?? NO! Oh I just love this! And the show is so great. My daughter is 3 and she learns so much from the show! She remembers the songs they sing to learn a lesson on the show and always sings them. My daughter would be so excited to receive Daniel's Treehouse! We love Daniel and all his friends! I got one for my granddaughter and can only describe it as poorly engineered, cheap and a danger to any child. The slide does not fit properly, comes apart and falls off constantly. The stars to place on the treehouse ceiling constantly peel off. The elevator is almost unusable. The small shelf shown for star gazing is loose and comes out every few minutes. Fred Rodgers would be so embarrassed by this heap of defective plastic.